The first thing you need to look out for is price. In this matter, money is everything. If someone's trying to sell you a sword you KNOW is too cheap for what it claims to be, it's almost certainly worthless. Stainless steel swords are very low maintenance, their length makes them brittle and they cannot take nearly the same punishment as a historical sword. 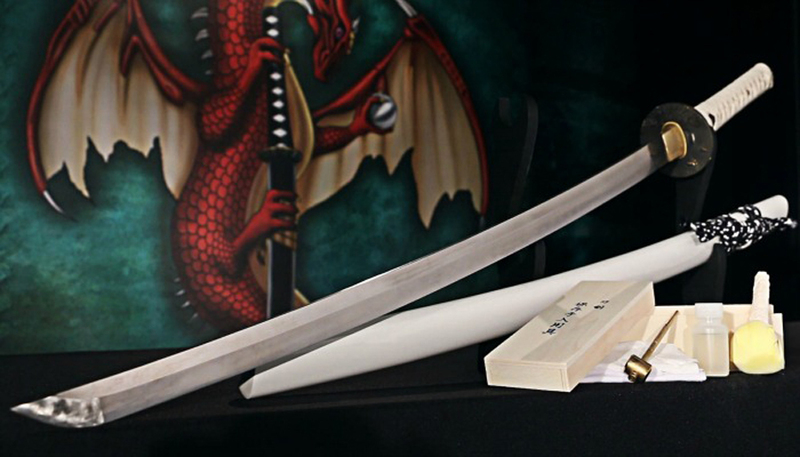 Real swords are always made from carbon steel which has a strong strength because of the impurities. And high carbon steel is easier to sharpen and holds an edge longer than most stainless steel which is usually hard to sharpen. Besides, for a sword to be functional, it needs to be properly heat treated. The goal of heat treating is to achieve a balance between toughness and hardness. Balance is the single most important variable in the construction of any weapon. There are many different swords and each have a different optimal balance. These are different per sword and there are general rules each follows but ultimately it is up to you to find which balance works for you. Weight is somewhat related to balance, because ultimately the weight of a sword could be heavier but the counter balance could be too making it feel less heavy when swinging. The longer a sword is the more reach you have, but it also become more difficult to maneuver, more importantly it need to be in relation to your body, because you will be manipulating the sword as an extension of you body when you use it, it needs to be proportional to you. The flexible steel won’t chip or crack and send a piece of debris flying through the air. If you plan on training with the blade, it might be worth making it more flexible than would be the norm, so that when you thrust it into your training partner the sword will have some “give” and do less damage to your training partner. 7. Is it hand made? If you look at the tip of the sword it should be long and well defined. But a fake sword has a machine cut tip that is shorter and not defined at all. Not all swords that have short tips are crap because the tip could be ether or. Long is good for a stab but a short tip gives you a longer cutting edge.